QUICK JUMP: Contestants Pageant Information How to compete in National American Miss Nebraska 2012? The 2012 National American Miss Nebraska pageant concluded with Jasmine Westbrook winning the title of National American Miss Nebraska 2012, Chrissi Beaulieu winning the title of National American Miss Nebraska Teen 2012, Jamie Wilhelm winning the title of National American Miss Nebraska Jr. Teen 2012, Savannah Soltero	wining the title of National American Miss Nebraska Pre-Teen 2012, Hannah Kost winning the title of National American Miss Nebraska Jr. Pre-Teen 2012 and Hannah Lienemann winning the title of National American Miss Nebraska Princess 2012. 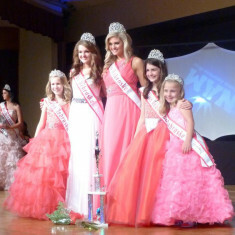 They also won the opportunity to represent Nebraska at the 2012-2013 National American Miss pageant.